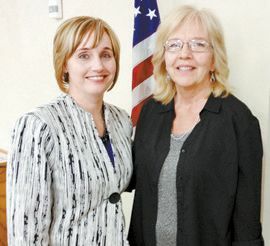 By Pat VerSteeg — District Attorney Angela Marsee spoke to Kiwanis/Senior Citizens’ this past week about what’s happening at the District Attorney’s Office. Marsee was elected 4 years ago as District Attorney in District #2, comprised of Custer, Beckham, Washita, Ellis and Roger Mills Counties. Recently Marsee was re-elected without opposition for another 4-year term.